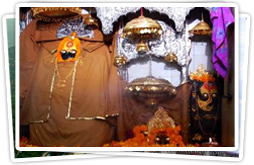 Shri Naina Devi Ji is one of the most notable places of worship in Himachal Pradesh. Located in Distt Bilaspur, it is one of the 51 Shaktipeeths where limbs of Sati fell on Earth. This holy place witnesses the huge crowd of pilgrims and devotees round the year and especially during Shravan Ashtami and in the Navratras of Chaitra & Ashwin. Special fair is organized during Chaitra, Shravan and Ashwin Navrati, which attracts millions of visitors from Punjab, Haryana, Delhi, Uttar Pradesh and other corners of the country.